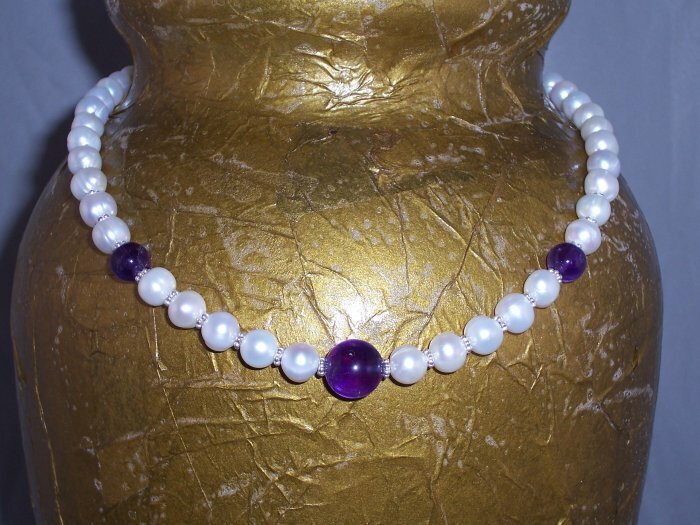 Excellent quality round freshwater pearls, with sterling silver spacers and deep purple amethyst accent beads. Approx. 18" in length with sterling clasp. Matching pierced earrings included. Earrings can be converted to clip-on, just request "clip on" during check-out. Many of my clients have difficulty finding pretty things in their size(off the shelf is either too small or too big!). So, if you find an item here on my site, but need a larger or smaller size, just let me know- at check out there's a box for "additional information" to specify color/size/personalization, etc. Type in the correct length, and I'll send exactly what you need. Visit my e-store to see the full line of high quality jewelry! Many of my designs are one-of-a-kind or limited runs of up to 4 sets. As always, I offer FREE SHIPPING to US and Canada for all jewelry purchases- unless otherwise specified.